Diagnosed with Helicobacter Pylori at Christmas. Due to HP becoming antibiotic resistant, current treatment consists of at least 2 different antibiotics plus an antacid. If that fails, more antibiotics. Having spent a number of years trying to build up my immune system by improving my diet I don’t want to wipe out all the ‘good’ bacteria as well as the baddies. Have researched the infection and alternative non-prescription treatments and don’t believe there is a proven natural cure, only hearsay. Has anyone been in a similar situation? ie feeling damned if I don’t take the drugs and damned if I do? Thanks for listening. Hi there am I the same predicament! Have been treated twice for helicobacter pylori. Had a breath test and have still got it. Antibiotics prescribed again and I don’t want to take them. I Rarely get reflux and feel fine. My doctor says it is up to me whether I treat it again as lots of people have HP and don’t get treated. I feel worse when I have the treatment and get candida which takes ages to cure. Would love to hear from the medical profession what happens if I choose not to treat again. I know there is a risk of stomach ulcers and cancer but I would prefer to give the Clever Guts diet a real go with apple cider vinegar etc rather than take those nasty antibiotics. Hi Genioz There isn’t an obvious answer isthere? Half my family think I should take the antibiotics, half don’t. My GP literally showed me the door when I said I wasn’t sure about the prescribed remedy. So I saw a different one who was a bit more polite and agreed that it’s a tricky one. Like yours she said it was up to me in the end. For the time being I am doing nothing about it. The use by date on my antibiotics is Feb 2019 so I’m putting off the decision until then. If not indefinitely 🙂 A gastroscopy might be useful to check for inflammation of my stomach lining but I don’t really want that either. Hi, I’ve had stomach problems for about 7 years, ever since I took elephant-sized antibiotics to cure diarrhoea whilst on expedition in the Himalayas (it had to be done). One year later I went to my GP and described my symptoms (felt like food was getting stuck high up under my rib cage, reflux especially when exercising, churning of the solar plexus). I gave a list of possible causes (ulcer, knackered oesophegal sphincter, tape worm, candida, h-pylori, other infection, hiatus hernia, benign growth). He laughed, did no diagnosis whatsoever, told me to prop the head of my bed up at night, and prescribed a PPI every day for the rest of my life!! I took the PPI for one month to see what happened, and I felt awful. I did start sleeping only on my left side to prevent reflux and that worked (see anatomy). I tried eliminating some foods from my diet, I tried many over-the-counter/off-the-web “cures” for h-pylori and candida, I started eating my own homemade sauerkraut, but didn’t keep it up. My issues returned again and again. More recently I had three bouts of vomiting for no reason whatsoever, the last two occasions with diarrhoea. Cue another trip to my GP and I demanded some diagnosis. After blood and stool tests, it was confirmed I have large count of h-pylori – 7 wasted years!! I’m currently on Amoxycillin, Clarithromycin and Lansaprazole for 7-days (standard NHS treatment for h-pylori). There was no advice from GP as to “what to do next”. Having read Clever Guts, I consider that next week I have a race against time to prevent any remaining h-pylori from regaining a foothold and ensure that good bacteria will dominate my guts asap! Therefore, I’m making some sauerkraut (again), making live yoghurt, I’ve started eating (during treatment) a broad diet many colours and much fibre – and I intend to step it up when my treatment ends in 4-days time. I will let you know how it goes – fingers crossed!! As for NHS – surely they can provide a booklet suggesting “what to do after treatment” otherwise patients will return ad-infinitum with the same infection. Danno: Seven years is a LOOONG time in medical research. Our understanding of the gut microbiome, gut conditions, antibiotics, diet choices is still evolving, still very much in its infancy. The NHS/ NICE etc will not make or amend recommendations until there is a large body of research supporting a given protocol. There is plenty of mainstream dietary and healthy living advice online: most of the UK population don’t know what the official recommendations are let alone follow them. Sadly most people want to be prescribed pills and potions, not to be advised to manage their weight/ be more physically active/ stop smoking/ eat a balanced and varied wholefood diet/ reduce stress/ practice sleep hygiene. 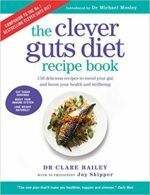 If you have a copy of the Clever Guts Diet and have been completing your detailed food and symptom diary (p.187-188) you are in a strong position to plan “what to do next”. Do understand that there is no one-size-fits-all healthy eating plan, so you will be experimenting on yourself (within the guidelines). If you need assistance ask your family doctor for a referral to a registered dietician and/ or post here. Cheers – I’m with you there. The Clever Guts diet is more or less what I eat anyway – I’m a veggie who is fit, slim and, apart from this infection, healthy. I’m upping the chicory, broccoli, olives and sauerkraut though. Danno: Red wine should be a pleasant addition! Without oily fish in your diet, are you getting sufficient vitamin D3 (UK sunlight is too weak for 5-6 months of the year) in and long chain omega-3s? If not do discuss supplementing with your family doctor/ pharmacist/ practice nurse/ a dietician. Vitamin D is key in normal immune function and the omega-3s have anti-inflammatory properties.